On behalf of the NPI team, I’m pleased to announce that we have completed work on a new release of Pacific NW Portal – Version 5.6, codenamed Otter Rock. Otter Rock is a maintenance release – the sixth in the Newport series. In other words, there aren’t any new major features… just bug fixes, updates to the index, and tweaks to functionality and branding to make things work better. Like every prior release of Pacific NW Portal, Version 5.6 is named after an Oregon coastal town or community. Otter Rock is located in Lincoln County only a few miles of north of Newport. 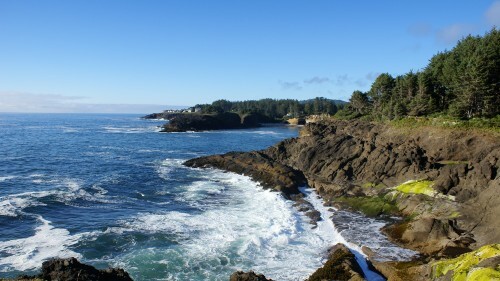 It is the smallest Oregon community to have its own Mo’s Seafood, and also home to the Devils Punchbowl State Natural Area. This post constitutes our official changelog for Version 5.6. Please feel free to leave questions, suggestions for future versions, or other thoughts on Otter Rock in the comment thread. Feeds for many Washington news sources reindexed. Several of the Evergreen State news sources that Pacific NW Portal has long indexed have recently revamped their websites and moved their content to new locations. Unfortunately, when they changed their URL scheme, they didn’t bother to redirect their old URLs. Consequently, we had to manually update a number of feeds that had gone dead. We are now indexing Crosscut, The Bellingham Herald, Q13 Fox, the Capital Press and several other sources again. New art on the front page. The graphical header above the Federal, State, and Local columns now consists of photo art derived from photographs in NPI’s image library. Depicted from left to right are the U.S. Capitol, Washington’s Legislative Building and the Seattle skyline. New afternoon and evening greetings. The afternoon and evening greetings now depict scenes from Oregon, while the morning and night greetings depict scenes from Washington. The afternoon scene is a spot on the Oregon coast near Newport (fittingly, as Pacific NW Portal 5 was codenamed “Newport”) and the evening scene shows a beautiful summer sunset on Crater Lake, with Wizard Island in the foreground. Duplicate filters turned on for more feeds. Owing to the number of feeds Pacific NW Portal indexes (some of which overlap or contain the same content), we’d begun seeing some duplicate items cropping up in several feeds. We have enabled additional duplicate filters where appropriate to ensure news items don’t show up twice or even three times. © 2019 The Northwest Progressive Institute. The Cascadia Advocate loaded in 0.201 seconds.